On Tuesday, Secretary Penny Pritzker visited Portland, Oregon and Takoma, Washington where she held roundtable discussions on the importance of trade to our economy with key area business leaders. 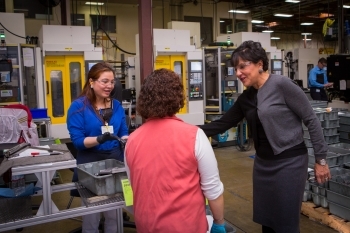 Secretary Pritzker started the day with a tour and visit to General Plastics, in Takoma, Washington, a leading manufacturer of plastic-based goods. During the tour she heard from local business leaders about their experiences exporting to foreign markets and some of the challenges they currently are facing. During the roundtable discussion with local businesses, Secretary Pritzker noted how trade and exports benefit American manufacturers, such as General Plastics. Later in the day, Secretary Pritzker visited the headquarters of Leatherman Tool Group, Inc. a leading manufacturer of multi-use tools in Portland, Oregon. Leatherman currently employs 500 Oregonians and exports their products to over 100 countries around the world. During the roundtable discussion, Secretary Pritzker highlighted how the current trade deals being negotiated will strengthen U.S. exports, manufacturing, and improve American competitiveness in the global economy. Local business leaders from Intel, Columbia Sportswear and Columbia Green also participated in the discussion. 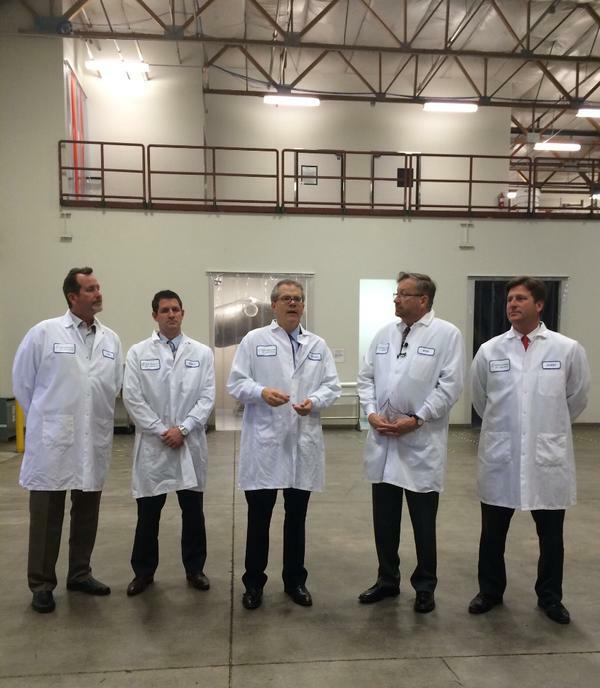 Yesterday, Deputy Secretary Bruce Andrews visited Phoenix, Arizona to learn about local businesses who export goods. He first joined Phoenix Mayor Greg Stanton and APS BioGroup President & CEO Bob Davies for a tour of APS BioGroup’s manufacturing facility. The Phoenix-based producer and manufacturer of health products exports their goods to 57 countries. Exports have been part of the company since its inception, and in 2011, it received the President’s “E” award for increasing U.S. exports. After seeing APS BioGroup’s facilities and meeting employees, Deputy Secretary Andrews talked with local business leaders about the importance of trade and exports to the local, regional and national economy. Exports support 11.3 million jobs nationwide, and they support nearly 96,000 jobs in Arizona. In 2013, Phoenix exported $11.5 billion, making the city the nation’s 27th largest export market. In addition to exports, American prosperity is directly tied to our ability to reach new markets and new customers beyond our borders. To gain access to the 95 percent of consumers who live outside the United States, it is crucial that Congress pass trade promotion legislation, which will enable the Obama Administration to negotiate two major trade agreements. The Trans-Pacific Partnership (TPP) and the Transatlantic Trade & Investment Partnership (TTIP) are comprehensive, high-standard trade and investment agreements that are currently in the midst of negotiation. Reaching an agreement on TPP and TTIP will give American companies a level playing field to compete with other countries for opportunities with approximately 65 percent of the world’s GDP. American access to markets abroad will also enable U.S. businesses to expand, hire more workers, and pay better wages at home. During a roundtable with Phoenix business leaders and Mayor Stanton, Deputy Secretary Andrews highlighted the advantages of America implementing new trade agreements around the world, which consist of promoting our values, raising standards, and maintaining a global, competitive edge for our businesses. With our leadership and involvement in TPP, we are bringing together critical strategic alliances with partners around the world – ensuring that the United States continues to shape and define the global economic culture. Currently, the U.S. has 14 trade agreements in force with 20 countries. Mexico is Arizona’s largest export market, representing 36.4 percent of the state’s total merchandise exports. Countries around the world want American goods, and these new trade agreements will help our businesses get their goods and services into more people and countries, creating jobs and growth. International markets provide an opportunity for U.S. businesses to increase sales and overall competitiveness, but knowing how to get started and learning about foreign markets can be daunting. The U.S. Census Bureau can help. Although known most widely as the home of the decennial Census of U.S. households, the Census Bureau also is responsible for collecting, compiling, and publishing monthly trade statistics on all goods imported and exported from the United States. Every month, the Census Bureau releases information on the import and export of commodities such as soybeans, corn, rice, chemicals, steel, aircraft, and lumber. Together with the Bureau of Economic Analysis, which collects similar data on services imports and exports, the Census Bureau releases the “U.S. International Trade in Goods and Services” report. This report provides detailed information on import and export of merchandise by commodity and end-use category as well as by the multitude of countries and areas with which the U.S. conducts international trade. All of these reports are available at the Census Bureau’s foreign trade web page. How can this information help U.S. businesses? The Census Bureau provides detailed information on more than 9,000 export commodities and 18,000 import commodities. Easily accessible online, this information assists U.S. businesses in making informed decision by tracking the global marketplace for their product and identifying possible opportunities to expand to new markets. In addition to data, the Census Bureau provides resources and tools to help businesses export. The Census Bureau’s International Trade Management Division conducts outreach and training around the country. Training includes webinars, seminars, workshops, and blog posts on using trade data, understanding foreign trade regulations and utilizing the Automated Export System, which allows the electronic filing of export information directly to U.S. Customs and Border Protection. These same data are the source of the Census Bureau’s merchandise export and import statistics. The next two-day training on the Automated Export System begins on January 21 in Houston, Texas. Trade is a vital part of our economy, and the Census Bureau plays an important role in providing detailed timely information to U.S. businesses to make informed decisions.